Car leasing is a fantastic alternative to long term car rental in Munich. The insurance included is certainly a highlight, covering many European countries! Leasing is a tax free buy back programme endorsed by the French government to encourage tourism. There are only 3 companies you can lease from in Munich and these are; Renault, Peugeot and Citroen. The variety of vehicles offered by these three companies are extensive and selection of the best deal can be an overwhelming experience. Udrive takes the hassle from our customers and compare the rates from these three companies to suit your needs. We will simply compare and provide you with the best possible quote from one of these companies within 24 hours of receiving your quote request. We're confident that once you've compared our prices to those elsewhere, you'll find that our deals are unbeatable. Specifically designed for non-European residents and travellers planning an extended holiday in Munich between 17 and 175 days, all vehicles are left-hand drive. It is a great alternative to car hire allowing you to explore the best of Munich as soon as you arrive. Please note that most vehicles include insurance with no vehicle excess, full factory warranty, personal accident insurance, free additional drivers, unlimited kilometres and 24 hour roadside assistance in 8 countries throughout Munich. 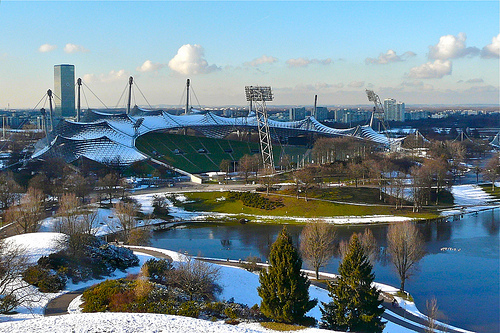 Munich is the third largest city in Germany and situated on the banks of the River Isar. It will certainly amaze you with its vibrant, multicultural atmosphere and the variety of interesting places to see. If you want to feel the spirit of the city, take a walk in the old town. It consists of many traditional, small bars and restaurants, where you can drink the local beer and try some specialities of German cuisine. It will enchant you with its special atmosphere and make you want to come back. But Munich is not just about beer and food. The city is an important cultural and scientific centre of the region. The famous Munich Cathedral; the Frauenkircheis, is one of the greatest examples of Gothic architecture in Europe. Its construction took place in 1494 and its towers are famous for their dome tops, remodelled on the Dome rock in Jerusalem. Inside the cathedral it’s possible to admire some real treasures, made of bronze and silver. The cathedral has become the most famous building of the city. Munich has also much to offer for those who love history and enjoy museums. The most interesting is the Deutsches Museum which focuses on historic artefacts from science and technology. There is also the Museums ensemble which is three at museums showcasing different time periods from the Middle Ages to the 20th century. One of the most remarkable attractions of the year is the carnival. The main bulk of events are traditionally held in February, when it becomes a large street festival of costumes and dance parades. Other events including dance balls make the life of the city more intense and colourful. The atmosphere of fun draws in many tourists and makes Munich a very attractive destination. Possibly the biggest festival in the world, the Oktoberfest is held every year for 16 days from late September to October. Thousands of people enter large and big tents to celebrate traditional beer and food. Based on Bavarian culture, if you visit Munich during this event, pre book your accommodation well in advance. The Schloss Nymphenburg Palace dates back to 1665 and a full day can be spent exploring it and the gardens. Built for the 1972 Olympics, the Olympia Park is open every day and great for family activities. A convenient way to see Munich and Germany is by hiring or leasing a car.